Four Laguna Beach High School teachers were awarded grants totaling $20,000 from the Festival of Arts (FOA) Foundation to enhance the fine arts department, specifically the school’s art, ceramics, dance, and theater programs. Each teacher received a $5,000 grant for their program. “LBHS Drama is grateful for the support received from FOA, which helped elevate the production values related to our spring musical, providing our students with a professional-style experience and our audiences with a crowd-pleasing show,” said Laguna Beach High School and Thurston Middle School Drama Teacher and Director Alexis Karol. “Additional funding was utilized to bring in professional experts for master classes, enriching the student experience with unique opportunities for study and training,” she concluded. The FOA Foundation has been a longtime supporter of the visual and performing arts in the LBUSD and will be recognized at the school board meeting tonight, Tuesday, June 26 at 6 p.m. For more information about the Festival of Arts Foundation, including its grants and scholarships, visit www.foapom.com/about/grants-scholarships. 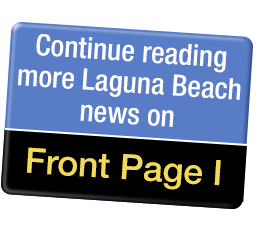 The Laguna Beach Unified School District Board of Education will hold a special Board meeting tonight, Tuesday, June 19 at 6 p.m. in the LBHS Library to review survey data regarding recommended changes to the school calendar, which have been recommended to go into effect at the start of the 2019-2010 student instructional year. Will the school calendar change for LBUSD students starting in 2019-20? Results of the Board of Education’s special survey, presented tonight (Tuesday, June 19) to the public, will likely play a big role in the decision. The changes recommended by the committee include moving the calendar start date up a week and a half earlier, to August 21, and moving the end date up a week earlier to June 11. This would align LBUSD with other nearby districts that have made similar changes in recent years. Tonight’s special meeting is open to the public. SchoolPower has named Sarah Durand as its new executive director. Durand was chosen from a field of over 80 applicants during an exhaustive search process that began after Robin Rounaghi, SchoolPower’s current executive director, announced that she was stepping down after five years in the position to spend more time with her family. Durand will take the reigns of the organization in August. Durand has lived in Laguna Beach with her husband for the past 14 years and has three children in Laguna Beach schools. She graduated from UCLA with a degree in communication studies and built a robust career in digital marketing, product management and website development for organizations including Disney Interactive, Stanford Children’s Health, and Laguna Beach-based MacGillivray Freeman Films. Durand has been a dynamic leader for our schools through PTA and site council, and has served as a SchoolPower trustee. SchoolPower’s executive director partners with an all-volunteer board of trustees and a small, dedicated staff to oversee events and programs as diverse as the Community Campaign, Dinner Dance, Fund-A-Need, Chef Challenge, Dodgeball, 3 Clubs Barefoot Golf Classic, Business Alliance, Real Estate Honor Roll and the Student Directory. This year SchoolPower will donate approximately $760,000 to support LBUSD initiatives and programs like digital literacy, social emotional support, music, and the arts. Laguna Beach High School seniors Marco Lybbert and Andrew Keyser were announced as the winners of the top two instrumental music awards for 2018 by LBHS Instrumental Music Director Jeremy Chung at the Music Boosters’ annual Band Picnic on June 9. Andrew Keyser received the John Philip Sousa Award to recognize superior musicianship and outstanding dedication. Since 1955, this award has represented the pinnacle of achievement in honoring the top high school band student each year. Keyser’s name will be added to the National Sousa Registry. Marco Lybbert was presented with the Louis Armstrong Jazz Award, which was inaugurated shortly after this great jazz artist died in 1971. This achievement represents the highest level interscholastic award given to a high school jazz musician in recognition of outstanding musical achievement and dedication to the program. Both winners received personal trophies, framed certificates, and award pins. Their names will be added to the perpetual plaques for each award showcased at Laguna Beach High School. At the June 12 School Board Meeting, the LBUSD Board of Education recognized the academic and athletic excellence of more than 80 students. The champion students were celebrated along with teachers and staff at the meeting. Included among those recognized were: Women’s Short Board Surf Team (Scholastic Surf Series High School State Champions), Boys Tennis (CIF Champions), Elementary Spelling Bee (Lyric Hagen, Winner), Reclassified English Learner Students, Juntos Mentors, and Destination Imagination®. Additionally, on June 12, the Board of Education took action to ratify the 2018-19 revisions to the 2017-2020 Agreement negotiated by the designated representatives of the Laguna Beach Unified Faculty Association and the Laguna Beach Unified School District. It was also voted to ratify the 2018-2021 Collective Bargaining Agreement negotiated by representatives of the California School Employees Association and its Laguna Beach Chapter #131 and the LBUSD; major provisions remain in place. The board approved the purchase of the ST Math supplementary mathematics intervention program for piloting during the summer school program and continuing through the 2018-19 school year. The pilot is a one-year online subscription that includes onsite professional development, self-guided online courses, and webinars for teachers. El Morro Elementary School was named to the 2017-2018 Educational Results Partnership Honor Roll for its high achievement and student success. The program, sponsored by the Campaign for Business and Education Excellence, is part of a national effort to identify higher-performing schools and districts that are improving student outcomes. The Anti-Defamation League has designated Laguna Beach Unified School District a No Place for Hate® district, recognizing its commitment to creating safe and respectful learning environments for students. LBUSD is now streaming its board meetings online. For more information, visit www.lbusd.org/boardmeetings. Special Board of Education meeting on school calendar will take place Tuesday, June 19 at 6 p.m. The calendar survey data review is an information only item. No action will be considered at the board meeting. The Board will provide district staff with direction on the next steps in the process. A copy of the Hanover report will be sent out in advance of the meeting. This summer, LBHS Drama has a ton of exciting events to look forward to – kicking off with their Annual End of the Year event on Saturday, June 16 at 4 p.m. in the Senior Quad. LBHS students and their families are encouraged to attend. Awards and senior scholarships will be distributed, and the infamous and always humorous “PAP Video” will be premiered. LBHS Drama families will receive an email with additional details. Additionally, Summer Camp registration is officially open. The optional camps will meet August 20 - 23 in the Greene Room, LBHS Room 55. Instruction and activities will focus on audition preparation and techniques for drama and musical theatre. Drama students are also encouraged to attend Dance Camp. A supervised lunch break will be provided for middle school students attending both camps. Registration fees are $200 per discipline or $400 for both. Registration is currently open at www.lbhs.booktix.com. LBHS Drama received 11 nominations for the National Youth Awards in their first year of participation. Outstanding Production in the Junior Division was awarded to The Lion King, Jr. Outstanding Lead Performance in a Musical was awarded to Malin Glade as Natalie and Ian Winefordner as Chad in All Shook Up. Outstanding Lead Performance in a Play was awarded to Luka Salib as Otto Frank in The Diary of Anne Frank, Claire Tigner as Anne Frank in The Diary of Anne Frank, and Ian Winefordner as Ben in Night of the Living Dead. Outstanding Guest Performance was awarded to Luke Dressler as Mr. Dussel in The Diary of Anne Frank. Outstanding Supporting Performance in a Play was awarded to Chloe Bryan as Edith Frank in The Diary of Anne Frank. Outstanding Costume Design was awarded to The Lion King, Jr. Outstanding Sound Design was awarded to Kennedy Hobson for All Shook Up. Lastly, Outstanding Musical Direction was awarded to Roxanna Ward for All Shook Up. For the second year in a row, a Laguna Beach team has won the Little League AA Tournament of Champions, where the regular season and post-season champions from Laguna Niguel, Laguna Hills, Rancho Niguel, and Laguna Beach compete against each other. This year’s Laguna Beach AA champions, Bialetti, beat the Rancho Niguel champion Padres 9-4 in a thrilling six-inning game. Wyatt Bogdan pitched five strong innings for Bialetti, giving up four runs, while walking none and striking out nine batters. Aaron Crosby came in and struck out the side in the sixth inning to seal the victory for Bialetti, who never trailed in the game. Kyle Kaiser got the fun started in the first inning with a two RBI single, as Bialetti jumped out to an early four to zero lead. Kaiser would also later hit a triple, as he and Bogdan both slugged two hits during the game. Jacob Bystrom made an incredible diving catch in foul territory to end a three-run rally by the Padres in the fourth inning. Bialetti won the game with great base running and solid defense on the way to the team capturing their third championship of the season (LBLL regular season, postseason, and TOC). It was an exclamation point on an incredible 20-1 overall record, including 15 wins in a row to end the season. Congrats to the members of Bialetti on their remarkable achievement: Wyatt Bogdan, Archie Bradshaw, Jacob Bystrom, Aaron Crosby, Parker Daniels, Jack Gonzales, Kyle Kaiser, Carson Kruidinier, Hendricks McMann, Dane Seybold, Aidan Huhn and Braylon Vellmure, along with Coaches Jarren Gonzales, Jeff Bogdan and Manager Brian Vellmure. Cadence Peery, 13, of Laguna Beach, competed in two individual events at the SCMAF (Southern California Municipal Athletic Federation) Track and Field Championships on June 3, which were held at Warren High School in Downey. Prior to the championships, she qualified for her events, initially, at the Laguna Beach City Youth Track Meet on April 20, advancing her to the SCMAF OC Meet in Costa Mesa on May 20. Winning first place in both events at the county meet, Peery thus qualified for a spot at the SCMAF Championships. As a representative for Laguna Beach, Peery placed first in the Girls Division ‘05 100 Meter Dash with a time of 13.32 seconds and second place for the Girls Division ‘05 Long Jump with a distance of 13’4”. These results have qualified her to compete in the 30th Anniversary of the California State Games, held July 14-15 in San Diego.